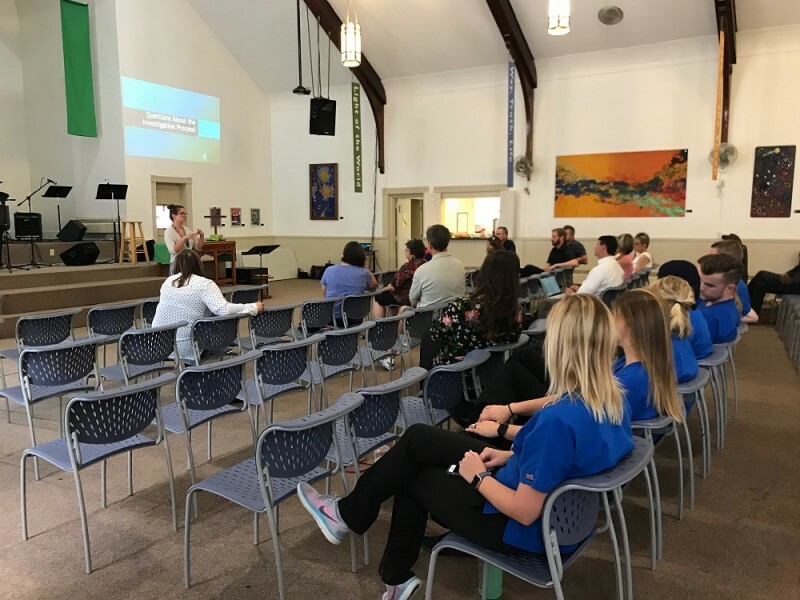 Alicynne Glazier, the public health epidemiologist newly hired by the Kent County Health Department, still gave her presentation to both groups, explaining the process and guidelines the KCHD follows for addressing concerns at the July 19, 2018 meeting at Servants Community Church. At the first meeting, several nursing students from Grand Valley State University came at the invitation of Reppart. 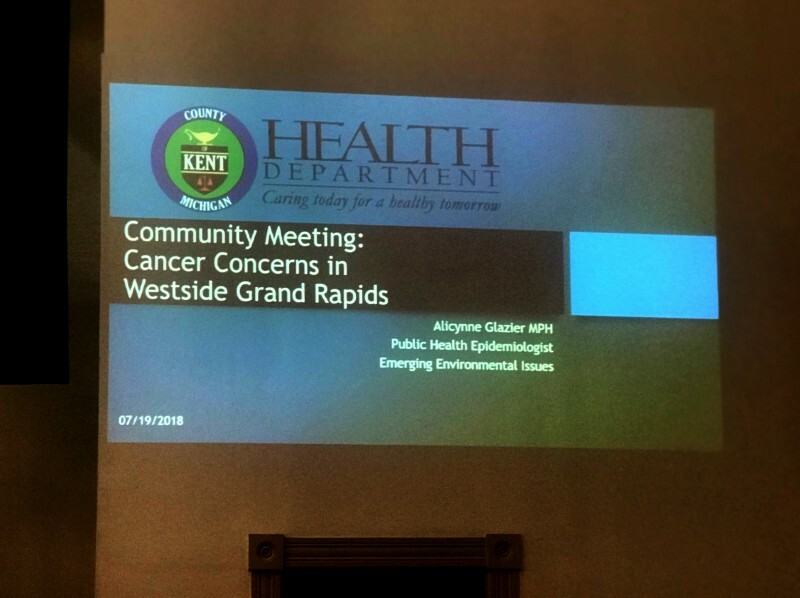 Outside of the nurses and various city, county, state and an official from the EPA, only two Westsiders came to the first meeting and only two came to the second meeting. 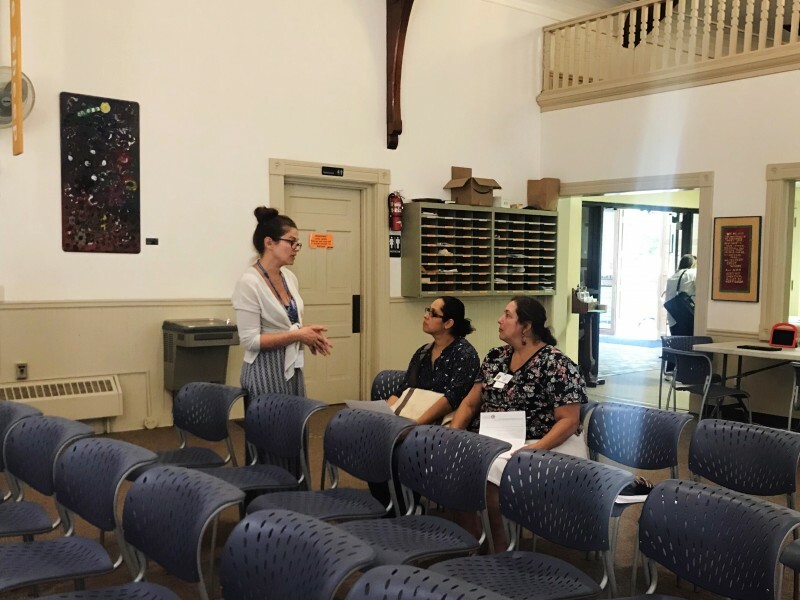 Alicynne Glazier, the public health epidemiologist newly hired by the Kent County Health Department, still gave her presentation to both groups, explaining the process the KCHD follows and their guidelines for addressing community concerns. “Neighbors started asking questions and what we saw was some general information. But to understand it from a public health perspective, we need more details. So our Epidemiology Supervisor, Brian Hartl, worked with them to provide a form that collected more detail. So really the message I have today is that Kent County supports the concerns of our community. And the health department really is here for the people and our goal is to support them,” Glazier said. Fabiola Cerrato-Jimenez and Terri San Miguel were the two residents who came to the second meeting at 5:30 p.m.
Nicole Pasch from Environmental Services, Amy Snow-Buckner, Acting Managing Director of Communications, Tom Almonte, Managing Director of Public Services, James Hurt, Director of Public Services from the City of Grand Rapids and Third Ward Commissioners Kurt Reppart and Jon O’Connor were all present at both meetings. Judie Alfano from the Michigan Department of Environmental Quality and Dion Novak from the United States Environmental Protection Agency were also present. Three surveys, one for current residents, one for former residents and one for deceased residents to be filled out by family members were available to fill out in paper form. There were also tablets set up to help people fill out the forms online. “Both the online and paper forms ask the exact same questions, but the paper forms are more private,” noted Glazier. Glazier also mentioned the surveys were submitted to a translator and will be available in Spanish soon as well. "That was my concern, I still have small kids. My husband and I, we wondered, was the pollution coming from the water? Is it something that we can prevent from our kids to have later on?" asked Cerrato-Jimenez. "The contamination is still there, the landfill is still there, but it’s covered by four feet of dirt so that there isn't any exposure, there isn't any way to be exposed to that anymore. People in the area get their water from the City, they don't get it from the underground water around here. And right now the City has an ordinance in place that doesn't allow you to put wells into that area to get water," replied Novak. Snow-Buckner added, "Residents were hooked up to the City water system between 1892-1917." Officials present all urged current and former residents to fill out the forms so the KCHD has strong information moving forward. The presentation given will be shared with both the John Ball Neighborhood Association, the Southwest Area Neighbors and Commissioners Reppart and O’Connor. Residents can fill out the forms online here.